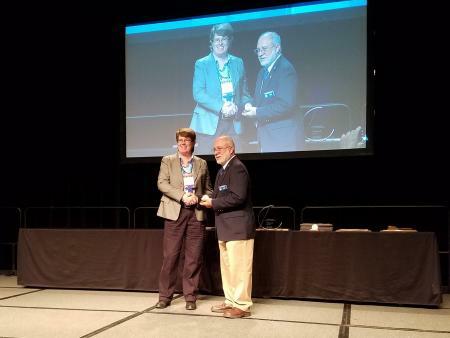 Professor Ann D. Christy was named the 2017 recipient of the Massey-Ferguson Educational Gold Medal Award at the ASABE Annual International Meeting earlier this month. Christy is a Professor in the Department of Food, Agricultural, and Biological Engineering and the Department of Engineering Education, and Assistant Dean of Teaching and Learning in the College of Engineering at The Ohio State University. The Massey-Ferguson Education Gold Medal is awarded to recognize “those whose dedication to the spirit of learning and teaching in the field of agricultural engineering had advanced our agricultural knowledge and practice, and whose efforts serve as an inspiration to others.” Christy joins several other FABE faculty and alumni who have also received this award since its establishment in 1965. Christy was recognized for her contributions and impact on engineering education through excellence in scholarship, teaching, mentoring, and service. Christy’s scholarship in the field of agricultural and biological engineering education has achieved international recognition. Her scholarly work has resulted in over $2 million in grant funding, numerous awards, and 160 journal articles, book chapters, and conference proceedings papers. During her time as an instructor and advisor, she has supported her students both in the classroom and beyond by taking leadership roles to transform academic affairs, teaching, and learning. Christy was also the recipient of a 2017 President and Provost’s Award for Distinguished Faculty Service, which honored her long history of exceptional leadership at The Ohio State University.